Prepare for your future at the All-Majors Job Fair and the Maverick Majors Fair today, Tuesday, Sept. 29. 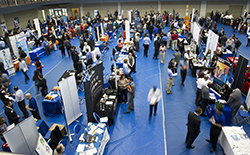 The All-Majors Job Fair brings employers to campus 10 a.m.-3 p.m. at the Maverick Activities Center. Learn more about your potential study areas at the Maverick Major Fair. The fair is 11 a.m.-2 p.m. in the Palo Duro Lounge of the E.H. Hereford University Center. Join the University Advising Center and department advisers in a fun atmosphere to learn more about the degree options available at UT Arlington and how to declare a major or minor. If you're undeclared or just exploring your options, don't miss out on this experience. 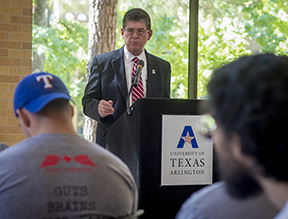 Starting the conversation: John Hall, vice president for administration and campus operations, joined President Vistasp Karbhari at Pizza with the President last week to talk to students about the "campus carry" law for concealed handguns. Hall chairs the University's committee that will develop UT Arlington's campus carry policy. Join the UTA Police Department for the annual National Night Out event Tuesday, Oct. 6. 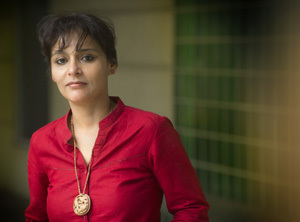 Ritu Khanduri, associate professor in sociology and anthropology, will speak on "The Culture of Cartoons" at this year's first Focus on Faculty lecture. 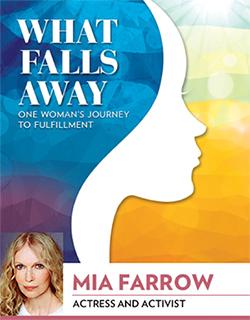 The event is at noon Wednesday, Sept. 30, in the sixth floor parlor of the Central Library. Dr. Khanduri will explain how Indian newspaper cartoons serve as teaching moments about identity politics and democracy. Focus on Faculty provides a forum for outstanding faculty to share their research and achievements with the UTA community. Khanduri's talk will be followed by a reception sponsored by the Honor Society Phi Kappa Phi. The event is free and open to all. Register now for the 35th annual Bed Races. The beds start rolling at 7 p.m. Wednesday, Oct. 7, at Maverick Stadium. The Bed Races feature beds on wheels with five students—four pushing and one riding on the bed—competing for fastest women's, men's, and co-ed teams and most spirited individuals. Individuals can register, too. Costumes are encouraged. Entry fees go to the Student Life Fund. There's also a field goal kicking contest. EXCEL Campus Activities and Campus Recreation sponsor the Bed Races. For more details, call EXCEL at 817-272-2963 or Campus Recreation at 817-272-3277. 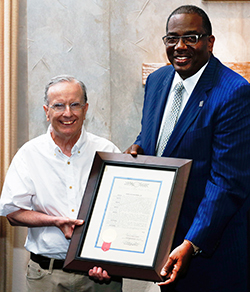 50 years of Saxe: Allan Saxe, left, associate professor of political science, received a state proclamation from State Sen. Royce West, D-Dallas, for his 50 years at UT Arlington. Dr. Saxe received the accolades at a reception last week with faculty, staff, alumni, and local officials. The educator also received a proclamation from the city, as well as gifts from the Political Science Department, for his half century of service. See more photos from the event. Faculty, alumni, and students gathered last week to celebrate political science Associate Professor Allan Saxe’s 50 years in the classroom. UT Arlington President Vistasp Karbhari praised Dr. Saxe for the profound impact and influence he's had on generations of students. “When you tell students his classes are full, they still show up even though they can’t get credit," President Karbhari said. State Sen. Royce West, D-Dallas, (B.A. sociology ’76, M.A. sociology ’79) a 2001 Distinguished Alumnus, remembered how much Saxe inspired him and classmates who took his courses in the 1970s. The educator received proclamations from the state and city, as well as gifts from the Political Science Department. Saxe assured those in attendance that he has no plans of retiring and invited everyone to return for his 70th anniversary. “We’ll see you back here in 20 years," he said. 'The Shorthorn' Press Fest Celebrate Press Fest with The Shorthorn. Enjoy live music from Skinny Is Green, snacks, drinks, games, and prizes while learning about The Shorthorn student newspaper and its digital offerings. 11 a.m.-1 p.m., University Center mall. The Shorthorn. Volleyball Mavericks vs. Georgia Southern. Pre-Game Tailgate: October Fest/Beer Tasting: Pink Night: Greek Out. Tickets $5; $3 with student ID. 6:30 p.m., College Park Center. Athletics. Friday Night Film: Ant-Man Rated PG-13. Free popcorn. Concessions for sale. $1, $1.50 with credit card. 9 p.m., Rosebud Theatre, E.H. Hereford University Center. EXCEL Campus Activities. Volleyball Mavericks vs. Arkansas-Little Rock. Youth Day: Jersey Day: Blaze's Kids Club: Post Game Autographs: International Frugal Fun Day. Tickets $5; $3 with student ID. 1 p.m., College Park Center. Athletics. Graduate School Writing Discover the differences between undergraduate and graduate school writing, selecting a thesis/dissertation topic, and basic formatting. Register online. 4-5:30 p.m., Room 601, Nedderman Hall. Also, 5:30 p.m., Thursday, Oct. 1, online; register online. Graduate Studies. Earth and Environmental Sciences Lectures Nilotpal Ghosh, right, lecturer in earth and environmental sciences, discusses “Evidence of catastrophe across the Permian-Triassic boundary in Spiti Valley, Indian Himalayas.” 4 p.m., Room 100, Geoscience Building. Also, Julia Morgan of Rice University, Oct. 8; Thomas Darrah of Ohio State University, Oct. 15; Bob Gregory of Southern Methodist University, Oct. 22; and Bastian Georg of Trent University, Oct. 29. Earth and Environmental Sciences. Mathematics Colloquium Series Santiago Schnell, president of the Society for Mathematical Biology and professor at the University of Michigan, is guest speaker. 3 p.m., Room 311, Pickard Hall. Also, Weiqiang Wang of the University of Virginia, Oct. 16, and Patrick Shipman of Colorado State University, Nov. 6. Mathematics. Arlington Technology Association UT Arlington President Vistasp Karbhari discusses the future of engineering professions and the roles engineers will play in designing and guiding the world’s mechanisms. Light breakfast provided. RSVP. Free. 7-8 a.m,, Room 100, Nedderman Hall. Arlington Technology Association. Food for Thought: Motivation Becky Garner, clinical assistant professor of kinesiology, presents an interactive program about motivation to fit your exercise program with your lifestyle. Noon-1 p.m., Room 213, Maverick Activities Center. Campus Recreation. Women's and Gender Studies Lecture Kathryne Beebe, right, assistant professor of history, and Anna Nogar of the University of New Mexico discuss “Transported in Spirit: Visionary Travel in the Old World and the New." Free. 12:30-2 p.m., sixth floor, Central Library. Women’s and Gender Studies. Graduate Business Forum Learn about graduate degree programs in the College of Business. Register online. 9:30 a.m.-noon Saturday, Oct. 10, Room 147, Business Building. Business. Safe Zone Ally Training Learn to create a visible network of support for lesbian, gay, bisexual, transgender, questioning individuals, and their allies. Register online. 1-4 p.m. Monday, Oct. 12, Sabine Room, E.H. Hereford University Center. Also, 9 a.m.-noon Monday, Nov. 16, Guadalupe Room, University Center. LGBTQA Program. Creating an Online Exhibit Graduate students can learn how to create professional online exhibits to enhance their academic presence by sharing primary source collections or publishing academic writing. Or use to build inquiry-based tasks for students or create lesson plans with accompanying sources. Register online. 2-3 p.m. Tuesday, Oct. 13, Room 315A, Central Library. Graduate Studies. RADS Self-Defense for Women Self-defense course for female faculty, staff, and students. Register online. Free. 9 a.m.-6 p.m. Saturday, Oct. 17, Room 102-B, Maverick Activities Center. Also, Nov. 7. UT Arlington Police. Outstanding Mavs: Cassidy Wheeler (7), left, Gabriela Alfonzo, Michael Guerrero, and Grant Copeland turned in outstanding performances in volleyball and cross country competitions last week. UTA went toe-to-toe with defending Sun Belt Conference champion Arkansas-Little Rock but came up short Sunday in a five-set thriller in Little Rock. Junior setter Cassidy Wheeler paced the Mavericks with a career-high 51 assists. On Friday, UTA fell 3-1 to No. 25 Arkansas State in Jonesboro. Sophomore outside hitter Qiana Canete had 16 kills and 11 digs. The Mavericks are 11-5 overall and 2-2 in conference play. They return to College Park Center this week for matches against Georgia Southern on Thursday, Oct. 1, and Arkansas-Little Rock on Saturday, Oct. 3. The women’s and men’s cross country teams both placed eighth among strong fields Saturday at the Texas A&M Invitational in College Station. Senior Katelyn Hayward was the top finisher among all UTA runners, placing 11th. Senior Gabriela Alfonzo was 15th. On the men’s side, sophomore Michael Guerrero led the Mavericks with a 17th-place showing, while junior Grant Copeland came in 29th. The Mavericks run in the Longhorn Invitational on Friday, Oct. 2, in Austin. The women’s tennis team had its weekend shortened due to rain Sunday at the Rice Invitational in Houston. Despite the unfriendly weather, the Mavericks went a combined 6-0 in the first round of singles matchups and 6-1 against Big 12 opponents overall. Junior Angeles de los Rios reached the semifinals of Flight 2. The women return to the court Friday, Oct. 2, at the SMU Invitational in Dallas, while the men compete Oct. 3-7 at the Saint Francis ITA All-American in Tulsa, Okla.
• Freshman Rachel Kroener has been selected to represent the U.S. at the International Paralympic Committee Athletics (Track and Field) World Championships in October in Qatar. As of spring 2015, she was ranked 18th in the world in the shot put and 11th in the javelin. • In its first tournament of the season, the golf team finished eighth Sunday at the Sun Belt Preview in Destin, Fla.